Dunmer Great House membership is largely a matter of birth and marriage, but Imperial colonists may also become retainers of a Great House, or may be adopted into a Great House. Initially an outlander may gain status in a house as an oath-bonded hireling, pledging exclusive loyalty to a single house and forsaking ambitions with all other houses. Later, after faithful service and advancement in lower ranks, an outlander may seek adoption into a Great House. Adoption and advancement to higher ranks in a Great House requires that a Great House councilor stand as sponsor for the candidate's character and loyalty. Finding a councilor to sponsor an outlander often involves performing a great service for the prospective sponsor and the Great House in question. In times of extreme danger, house councilors may choose to elect a "hortator" who has the ability to make decisions on behalf of the House as a whole. Election of a hortator requires unanimous consent among all councilors. It has been known for a single dissenting councilor to fight a potential hortator candidate in a duel to the death, thus protecting the honor of the councilor if they win or proving the candidate's ability if they lose. The Great Houses have their origin in the ancient customs of the Chimer, a self-exiled Aldmeri sect who followed their prophet Veloth across Tamriel from the west. They abandoned their former nomadic lifestyle, and divided themselves into political clans, which would become the Great Houses Indoril, Redoran, Telvanni, Hlaalu, Dres and Dagoth. In 1E 416, following almost two centuries of suppression by the ruling Nords, the Chimeri hero Indoril Nerevar united the squabbling Great Houses as Hortator, also making alliance with the Dwemer, their traditional enemies, and succeeded in driving the Nords out of the region. Nerevar and the Dwemer leader Dumac Dwarfking subsequently created the First Council of Resdayn to jointly rule the area as an independent nation. Resdayn flourished for a few hundred years until the War of the First Council broke out between the secular Dwemer and the orthodox Chimer Houses Indoril, Redoran, Dres, Hlaalu, and Telvanni. The role of the sixth House, House Dagoth, is not fully understood. 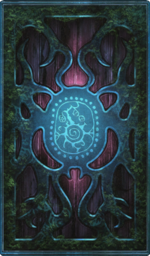 Some Imperial sources claim that they sided with the Dwemer in the war, while other sources, including the Apographa of the Tribunal Temple, claim that they never betrayed their kin. 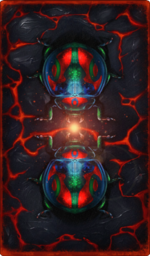 Whatever the case, House Dagoth was thought exterminated following their defeat at the Battle of Red Mountain. After Nerevar's death, three of his associates from House Indoril, Vivec, Almalexia, and Sotha Sil, succeeded to control of the Council, which they renamed the Grand Council of Morrowind. House Indoril, due to their association with Nerevar and the Tribunal, remained the dominant party in the Grand Council right through until the end of the Second Era. Throughout this time, the Grand Council was responsible for local governance in Morrowind, while the land as a whole was ruled indirectly by the Tribunal. In 2E 896, the Armistice was signed between Tiber Septim and Vivec which saw Morrowind reorganized as a province of the Empire. House Indoril swore they would resist this to death, and the Lord High Councilor of the Grand Council, himself an Indoril, refused to accept the treaty, and refused to step down. He was assassinated, and replaced by a Hlaalu. A number of other Indoril chose to commit suicide. House Hlaalu, who had advocated accommodation to the Imperials since the Legions started massing on the western border, took this opportunity to take over a number of Indoril councils. Their enthusiastic support of the Empire cemented the Hlaalu as the leading Great House throughout the Third Era. Little is known of the Grand Council through the Third Era, but the role of the figurehead Monarch of Morrowind, personally selected by the Emperor, was first filled by Queen Barenziah, a member of clan R'Aathim and thus House Hlaalu. [UOL 1] Her son, King Helseth of House Hlaalu, was the ruler of Morrowind at the end of the Third Era. His reformation of the Grand Council was seen by some as a return to more traditional Dunmer ways, although he also managed to persuade both his own House and House Dres to back the abolition of slavery, and carry that policy through the Council. During the Oblivion Crisis of 3E 433, the Empire pulled the Legions out of Morrowind and the province was left virtually defenseless. While House Redoran succeeded in creating an army, and House Telvanni were able to close some of the Oblivion Gates, the Redoran citadel of Ald'ruhn was destroyed by the Daedric invasion, and House Hlaalu was left powerless without the backing of the Empire. Following the eruption of Red Mountain in 4E 5, which obliterated the settlements on Vvardenfell, Morrowind came under siege from the Argonians of Black Marsh; Helseth's abolition of slavery had come too late. House Hlaalu, due to their close ties with the Imperial administration, became the scapegoat for all of the Dunmer people's suffering. As a result, Hlaalu was stripped of its Great House status and dismissed from the Grand Council. 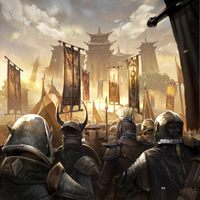 House Telvanni, having lost most of their settlements on Vvardenfell to the Oblivion Crisis, was almost extirpated in the Argonian invasion as well, with at least one report of its destruction when the last mainland settlement also fell to the Argonians; a few survivors escaped in a ship, "The Pride of Tel Vos", which was later found wrecked in Skyrim. The last child of the Telvanni familial line itself was brought up in Black Marsh under the Argonian name of Brand-Shei , although some of the House survived to re-found a colony in Solstheim under the aging Master Neloth. Telvanni, in fact, appears to have rebuilt well enough to hold its seat on the Dunmer council, while the previously unknown House Sadras was selected to fill the space left by Hlaalu. House Redoran became the eminent power in Morrowind, taking the position as leaders of the Grand Council. They moved the capital to the Redoran city of Blacklight, where the Grand Council meets within the Rootspire. By the immemorial customs of Dunmer society, a House may challenge the honor of another House in the person of one of the House's ranking nobles. The ranking noble of the impugned house is marked for death -- in ancient times, actually formally marked with a black banner, but in modern times, served with a formal written public announcement. If within the year of the challenge, the marked noble still lives, the challenging house must publicly forgo any further complaint or scandal on the matter. In pre-Tribunal Morrowind, feuding was carried out with open warfare. This was forbidden by the Tribunal, and only a ranking challenging noble or a Morag Tong assassin could attack the marked noble. Before the eruption of Red Mountain, Houses routinely engaged the Morag Tong, taking out regulated contracts called Writs. This custom permitted Houses to hassle one another on a small scale without threatening public peace and rule of law. 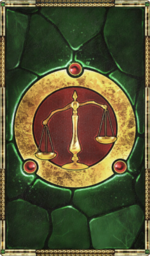 Codes of behavior under House Wars are complex and subtle, and the Morag Tong specialized in the honorable and legal prosecution of these factional vendettas. House Wars are expensive, dangerous, and disruptive to all Houses involved. On the island of Vvardenfell alone, a dozen or more Marked Challenges were being prosecuted at any one time. Little is known of the faction referred to by some as House Dwemer. During the time of the First Council, Resdayn was united by the Chimer hero Nerevar and the Dwemer king Dumac. 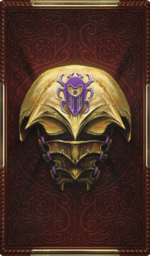 According to some Imperial texts and Tribunal Apographa, the Dwemer of Resdayn were considered a Great House. House Ra'athim was an influential family from the city-state of Ebonheart, they were known for being miners of mithril. Some of the most notable Ra'athim are Katariah and Moraelyn. House Salothan is a little-known lineage that died out simultaneously in a monumental battle, during the time of Chimer. They have an Ancestral Tomb in the northern West Gash, near the township of Gnisis. House Sotha was a minor House with holdings in the homestead of Ald Sotha, considered an unremarkable town belonging to an unremarkable family. The only known members were Sotha Sil, a future member of the Tribunal, and his older sister Sotha Nall. It is said that Vivec rescued Sotha Sil, the only surviving member of the House, from there when the town was destroyed by Mehrunes Dagon. This page was last modified on 10 March 2019, at 23:16.